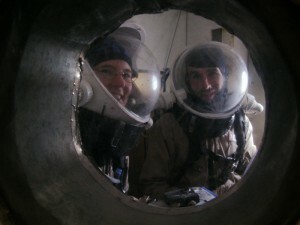 Kiri and Brian (Darrel invisible) in the airlock, ready to go out! Today we embarked on some more ambitious EVAs. First we spent a good chunk of time working out how to get the existing database of 500+ GPS waypoints into our GPS units. We had to convert the waypoints from UTM 12 to lat/lon format. Luckily, Brian already had a spreadsheet set up to do this. We then used gpsvisualizer.com to convert an Excel spreadsheet of the results into a .gpx file, which Garmin RoadTrip was able to import. Transferring to my Garmin eTrex Vista HCx worked great, but we couldn’t get RoadTrip to recognize any of the older eTrexes, which use an older cable setup. 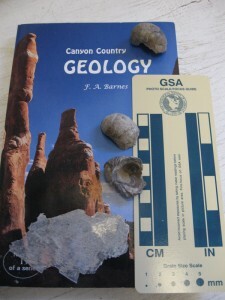 At any rate, Brian, Darrel, and I decided to head towards “Schiaparelli Huge Fossil Field”, since it was described as featuring both interesting fossils and sedimentary structures (cross-bedding). 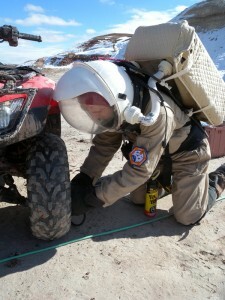 After Darrel performed some quick repair on Opportunity’s left front tire, we set out on our ATVs and headed north. The road was in good condition, mostly dry with just a few puddles. We quickly settled into a rhythm; I was in the lead and used a mirror strapped to my left forearm to check on Brian and Darrel behind me about once a minute. We roared up Lowell Highway, slowing to crest hills, ford muddy parts, and rumble over small cuts in the road. We stopped a couple of times to check our GPS location and take pictures. We ended up overshooting our desired turnoff, which was just as well since we realized it would have meant a long trek on foot rather than using the ATVs (these details aren’t always obvious, even with the best of maps!). We turned west onto Brahe “Highway”, which was a sharp change from Lowell; rather than a bulldozed road, Brahe was a single-lane set of tracks that climbed up into the rolling hills, which are called Sheep Knolls. We made it to the Salty Beige Hills before noticing that we must have (again!) passed our desired turnoff onto Schiaparelli Highway, and then attempted 3-point turns to head back without tearing into the land surrounding the track. During this process, Brian’s ATV (Viking-1) died, but after some effort he and Darrel were able to re-start it with the manual pull cord. The views from this area were just stunning, with soaring red cliffs evident to the north and west, including a striking isolated butte. We retraced our tracks and found the Schiaparelli turnoff, which was even less visible; it clearly had not been used in quite a while, and snow covered it in patches. But we were game to explore further, and so Darrel led the way. Starting up the far side of the first hill, he nearly lost his balance as the ATV leaped up out of the cleft; but he recovered quickly and Brian and I followed, a bit more slowly. We climbed a few hills this way and, fortuitously, ended up in a fossil field (Oyster Field). 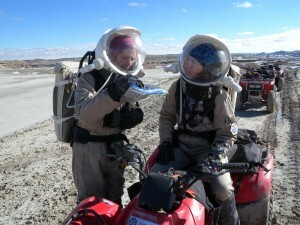 We climbed off the ATVs and collected some samples. Then, since we’d been out for an hour and a half, we decided to head back the way we came rather than try to follow Schiaparelli further south. Kiri on the triumphant return home from EVA 5! Our trip back, naturally, went faster than the trip out—but oh, it was beautiful, with the wind rushing past our helmets, the sun glancing off every shining surface, and the ATVs leaping and bucking beneath us on the road. I got much better at shifting smoothly and enjoyed racing along behind Darrel and Brian, who took turns leading for the trip back. 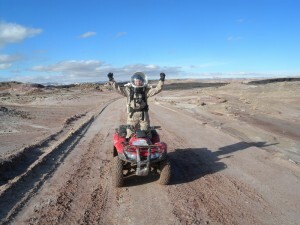 As soon as we returned, samples in hand, our remaining crew members (Luis, Mike, and Carla) set out for their own spin on the ATVs. This time, they were headed to Clara’s Cliff, far to the west and up on the ridge above us. They set out north, again on a nearly indistinguishable track, towards Olympus Mons. The sun had gotten lower, so it lit up the hills to the east in orange and gold. They struck Sagan Street just before Olympus Mons and entered a series of switchbacks up to Sunday Pointe. They slowed to take the turns carefully, and kept to the existing ruts to avoid the sides of the switchbacks, maintaining healthy following distances and stopping periodically to check that everyone was following. As they crested the ridge, they glanced back to the north and down to the hills and ridges and were struck by the contrast between the colored hills and blue, blue sky. They continued on, sloping down a little onto Mid-Ridge Planitia. The Planitia spread out before them in a vast expanse dotted with only occasional small shrubs, like pills on a worn sweater. 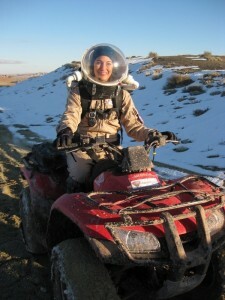 After some time, they realized that they would not be able to travel all the way to Clara’s Cliff and still return to the Hab before the sun went down, so they halted near intersection with Schiaparelli Highway, where Luis collected a sample of snow and another of soil. 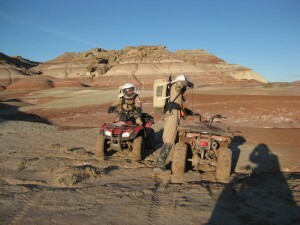 Here the Spirit ATV gave them some trouble starting, but after some rocking and encouragement, they were able to head back to the Hab. Dinner was an interesting melange originally intended as a tofu stirfry, but ultimately more of a melange of tofu and reconstituted vegetables, plus a concoction intended to mimic a stirfry sauce (and approximately succeeding!). Kiri! Keep your hands on the wheel! I have a crazy but somewhat serious question. 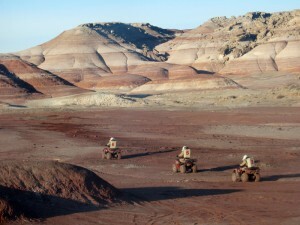 How would mapping work on Mars, since so much of it is unmapped, or less mapped? I know there are mapping projects going on from orbiters, but would that data correlate to an MPS (Mars Positioning System) in the same way the GPS works? Would that require extra satellites orbiting Mars? Or is that what you’re trying to simulate, your GPS readings correlating to Mars coordinates? Wendy, check out Mars Reconnaissance Orbiter. Quite a bit of the landscape has been photographed from orbit. Orbital cartography is today the standard here on Earth although I suspect that a working knowledge of basic geographic principles would improve precision on the Red Planet. MPS navigation (that’s Mars Positioning System) is another concern entirely. To achieve any position precision at all requires at least three satellites be visible for a relay to work. More visible satellites mean a more precise location. Currently there just aren’t that many orbital relays around Mars, navigation will require a very good understanding of orienteering. Wendy, I was stopped when I posed for that shot. You know me, I’m such a rule-follower! To follow up on Matt’s comments about MPS, we don’t think it’s likely that there will be Mars GPS anytime soon, and possibly not even in place if/when humans go there. One of my projects for this mission is to investigate how automated methods might be able to estimate location based on the content of digital photos, in the absence of GPS information. Right now we are lucky in that Brian has a GPS camera that stamps each photo with its latitude/longitude. But most cameras don’t have that, and in locations with no GPS signal (like Mars), the ability to tag photos with their locations would be useful for a variety of science investigations. I don’t know if it would be something you could deploy in the field and carry with you on EVAs (it would require yet another computer device of some sort to carry, or a next-generation camera with it built in). But ideally you could at least do post-analysis when you return and download your photos. It would be very easy to deploy ground based signal system that would allow similar triangulation and possitioning (easy compared to orbital anyway) as well as communications. Think about a bunch of solar powered HF radio repeaters stationed around a habitat. You’d know the exact location of those antenna and if they carried a possition signal you could easily triangulate your possition as long as you were within LOS of a couple of antenna. Not hard in some places on Mars, more difficult in others. 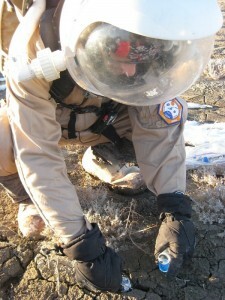 It would be very similar to Mars cellular possitioning system. Matt – wouldn’t a LORAN-type system work for navigation? Matt, I agree, installing some local infrastructure would be very useful. I think we’d employ as many complementary methods as possible. Jim, our engineer Darrel had the same suggestion! We don’t have the equipment for it, but it would be great for a crew to test it out. When you guys do your EVAs, I know you all carry your awesome GPS to track for our voyeuristic pleasure. Do you do your navigation with the GPS as well, or do you use orienteering methods? I’d be curious about lessons learned from electronically ‘blind’ expeditions and how well you’d find your way. Of course, I’m sure you’re all getting familiar with the landscape already, but maybe the next crew would try it without anything other than orbital photographs and compasses? Just for fun! You are right that we’ve gotten to know the terrain pretty well. Most of the nearby landmarks are known by heart already, and even some further terrain features.